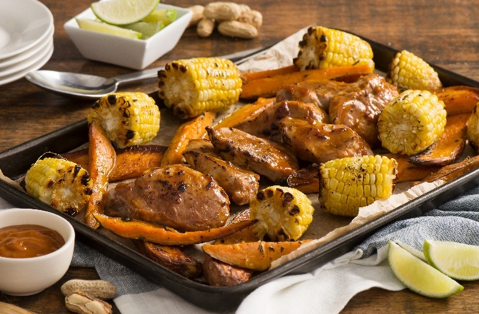 Peanut butter is the key ingredient in this sheet pan meal – adding creaminess and depth of flavour to the barbecue sauce. More great recipes can be found at www.peanutbureau.ca. Preheat oven to 425⁰F (220⁰C). In a large bowl, stir barbecue sauce with peanut butter. Remove about ½ of the sauce and set aside to use as a dipping sauce. Slice pork into 8 pieces. Add to bowl with sauce and toss to coat. Place on one end of the baking sheet. Leaving skin on, cut sweet potato into finger-sized pieces. Toss with oil, salt, pepper and thyme leaves. Place on baking sheet with pork. Roast 15 minutes. Meanwhile, cut corn into 2-inch (5-cm) pieces and season with salt. After 15 minutes of roasting, stir sweet potatoes and place corn on baking sheet. Roast until pork is cooked through, about 10 more minutes. Squeeze lime juice over sweet potatoes. Serve remaining barbecue sauce as a dipping sauce for pork.